I have a little bit of a confession. As you may already know based on my last post, I traveled up to New York City this past weekend to visit my sister, brother-in-law, and six-week-old (ridiculously cute and adorable) nephew. 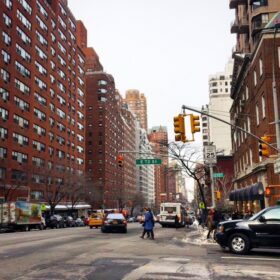 So, after arriving back home on Sunday morning in a daylight savings fog, I ran to the grocery store to grab Brussels sprouts and everything else I needed, rushed back home, and made it right then and there. Priorities, huh? If you recall, this year has been the year of Brussels sprouts on the blog. I dedicated an entire week to new Brussels sprouts recipes back in November, and truthfully can’t wait to do it all over again next year. Oh yes, that will definitely be happening. Obviously, I couldn’t wait until next year to share this one. 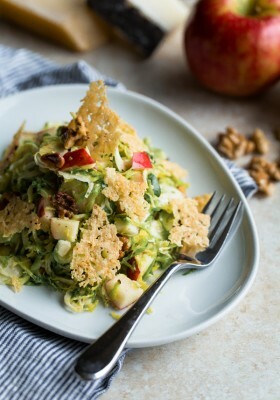 For now, think of today’s recipe as a final farewell to my favorite winter sprouted vegetable! 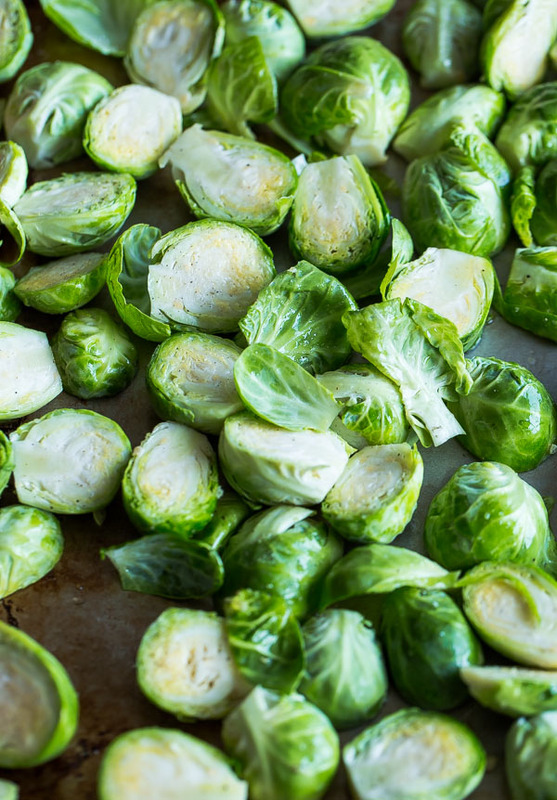 But seriously, move quickly and go out and buy Brussels sprouts…now! Despite my silent protests, I have a strong feeling they will disappear from stores altogether very, very soon. And trust me, you need to make this dish. The best thing about this salad? 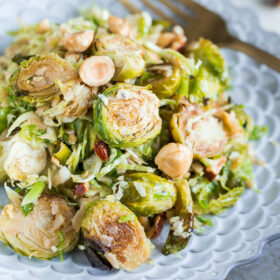 It combines both caramelized and roasted Brussels sprout halves with raw, shaved Brussels sprouts! 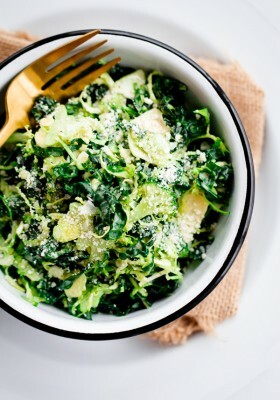 It’s the perfect gateway dish for those who are still hesitant to eat raw Brussels sprouts and well, obviously, texture heaven for those of us who are not. 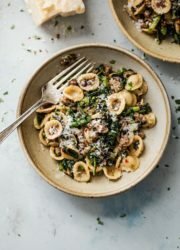 Although it is tossed with a vinaigrette and served room temperature (or cold from the fridge), it can definitely be served as a side dish to any number of things, or eaten on its own. We served it alongside seared and roasted pork tenderloin, if that gives you any ideas! First things first, you’ll need to round up a few ingredients. For the vinaigrette, you’ll need fresh lemons, red wine vinegar, olive oil, Dijon mustard, and my new favorite thing: pomegranate molasses. For those unfamiliar with this ingredient, pomegranate molasses is essentially cooked down, concentrated pomegranate juice. It’s not as thick as traditional molasses, but has some similarities. It’s a staple ingredient in Lebanese cooking, and it’s known for its thick, tangy yet sweet and musky flavor. Though it’s a bit hard to come by (note: I found some at my local Whole Foods in the baking section! ), I highly, highly recommend picking up a bottle. You can even order it on Amazon! Don’t worry, it has all sorts of uses in the kitchen and it will disappear before you know it. 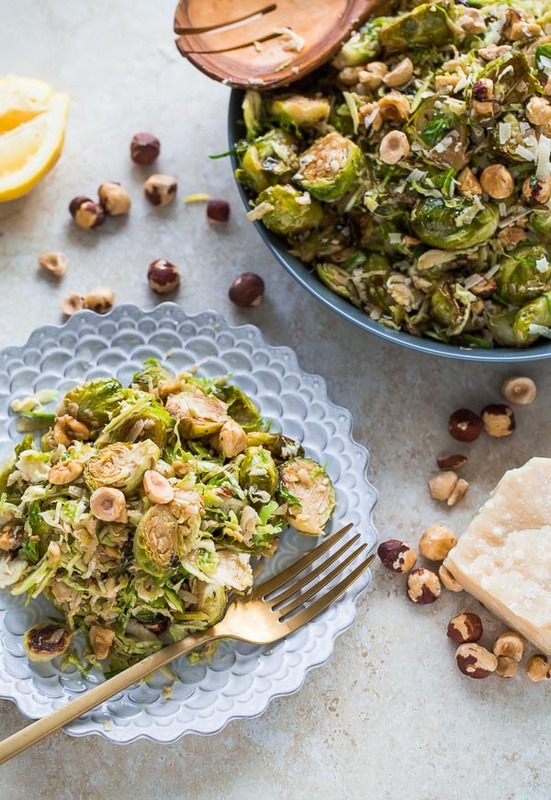 For the salad, aside from Brussels sprouts, you’ll need toasted and chopped hazelnuts and my favorite ingredient in the whole wide world, parmigiano-reggiano cheese. 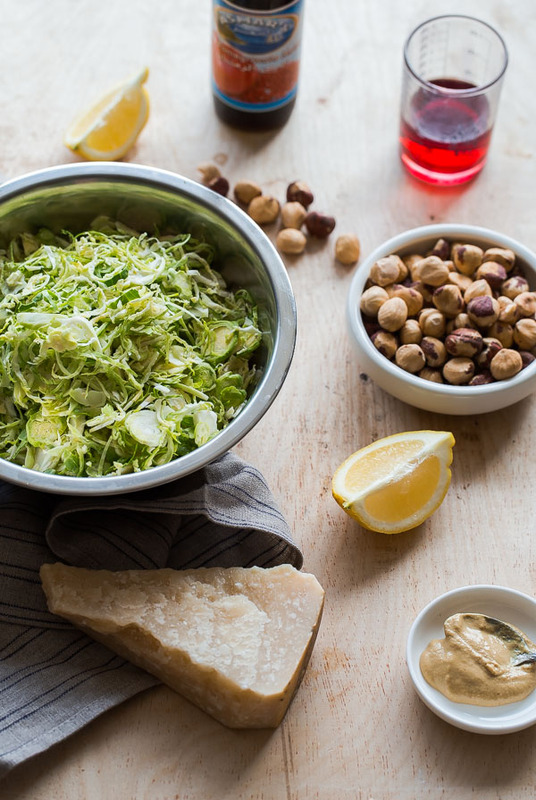 The combination of the roasted and raw Brussels sprouts, tangy vinaigrette, nutty and salty cheese, and crunchy hazelnuts is out of this world. You’ll love it! P.S. You should totally garnish this salad with fresh pomegranate arils. Preheat the oven to 425 degrees Fahrenheit. Set aside 1 and 3/4 lbs Brussels sprouts, trim ends and slice in half lengthwise. Place on a large baking sheet and toss with two tablespoons olive oil, salt, and pepper. Roast the vegetables at 425 degrees for 20 to 25 minutes, tossing them gently 1 to 2 times during the roasting time to ensure that they caramelize evenly on all sides. 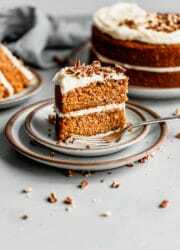 Allow to cool to lukewarm or room temperature, while you prepare the remaining ingredients. Prepare Vinaigrette: In a medium bowl, whisk together the lemon juice, red wine vinegar, pomegranate molasses, and Dijon mustard. Slowly pour in the olive oil, whisking continuously with your other hand, until the ingredients are emulsified. Season with salt and pepper to taste. Assemble Salad: Trim the ends of the remaining 3/4 lb of Brussels sprouts. Using a mandolin or the thinnest blade disc attachment of your food processor, shave them thinly. Combine the roasted (and cooled) Brussels sprouts and shaved, raw Brussels sprouts in a large bowl. Add the chopped hazelnuts and toss the salad with the vinaigrette until coated evenly. Add the grated parmigiano-reggiano cheese and drizzle the salad with 1 to 2 tablespoons of pomegranate molasses. 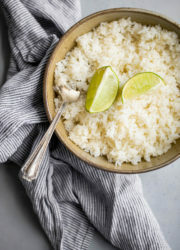 Toss again, season with salt and pepper to taste, and serve at room temperature (or chilled straight from the fridge). Salad can be prepared in advance and kept in an airtight container in the fridge for up to 3 to 4 days. 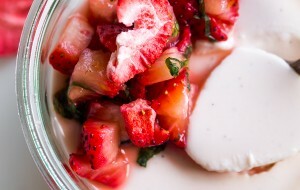 Suggestion: To add color, garnish and toss the salad with fresh pomegranate arils! Running home to make this salad sounds like the best idea!! I love that dressing! Sprouts are my favorite!! Love these flavors! Just beautiful! I have been all about sprouts this winter! I can’t get enough! 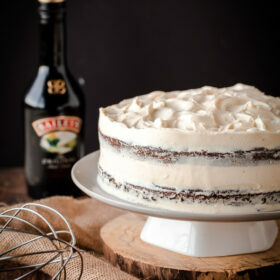 This is on my must make list! I can’t get enough either! Yay!! I LOVE when you make brussels sprouts, Laura!! I think I’ll give this one ago tonight. Haha! 🙂 Thanks Todd! I hope you liked it (if you ended up making it)! The addition of pomegranate molasses sounds amazing! I’ve been trying to convert friends and family into sprouts fans all year! I’ve still yet to make a salad, though. I better get on it before they’re all gone! Oh my gosh, they totally need to get on the Brussels sprouts train. They are so, so good. I’m convinced anyone who doesn’t think they like them, just hasn’t had them prepared the same way (although I’ve also heard it can be genetic?). This sounds INCREDIBLE!! 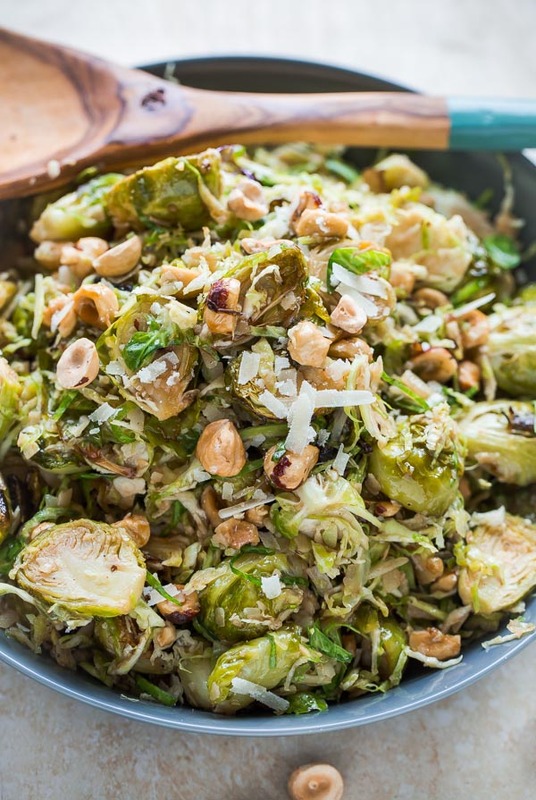 I love brussels sprouts so much and have a bag sitting in my fridge right now…totally making this ASAP! I can almost taste this salad and can absolutely see why you had to rush home and make it!!! Pomegranate Molasses is a fantastic thing to have in your pantry – try it instead of grenadine in a cocktail!!! This looks sooo insanely good! What a unique way to use the best veggie everrr! I’m going to try to grab one more bag before they’re gone for the year….sob! So sad about that too! this looks good! I need to eat more Brussel Sprouts! 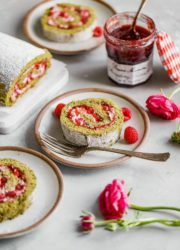 Great idea for a recipe! Brussels sprouts have become one of my favorite veggies. It will be sad to see them leave. This salad looks amazing. I love the use of pomegranate molasses. Your nephew is SO adorable!!!! And I am amazed that your sister is back to cooking such amazing things so soon. This salad sounds fabulous. 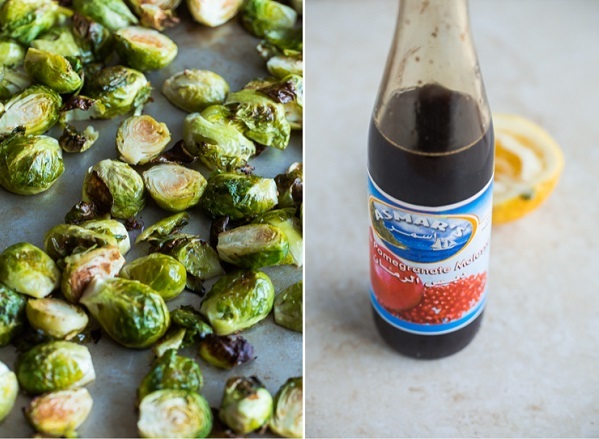 As both a brussels sprout and pom molasses addict, I obviously need to try it…maybe this weekend! Pomegranate Molasses is literally the best thing that has ever happened to my life. Ok, maybe I’m exaggerating because I haven’t had breakfast yet and I’m starving, but still. So great. I am going to try this asap! I use it on roasted cauliflower but haven’t made a vinaigrette yet. Thanks for the idea! Is this something I can make a day in advance? 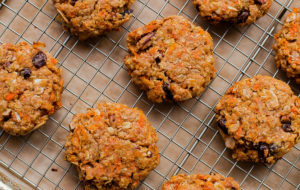 Will it hold up in the fridge — or is it better that I prepare it the day I plan to serve it? Hi Jarrod! You could definitely make this a day in advance! It does hold up very well in the fridge (and even tastes good cold; however I recommend serving it at least room temperature). I wouldn’t prepare it more than two days in advance max though! 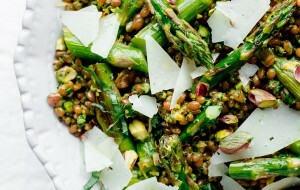 Fun and amazing salad, yum! 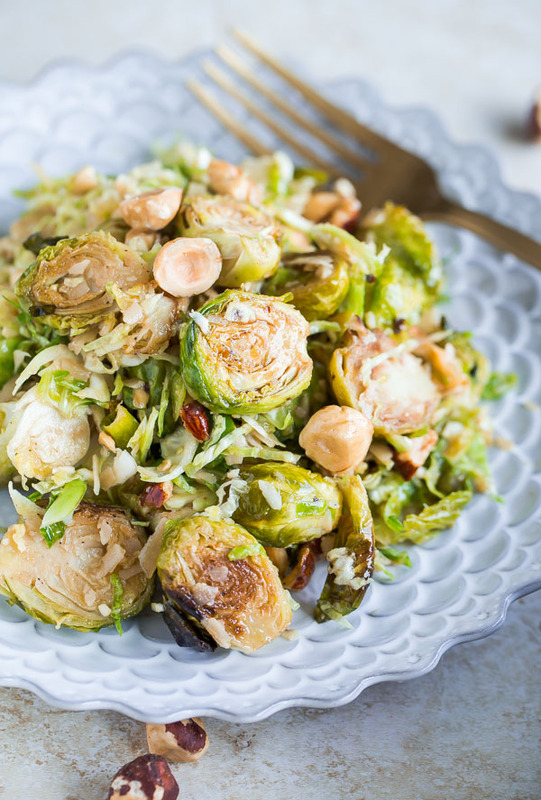 I love anything brussels sprouts and I love the flavors in this salad!